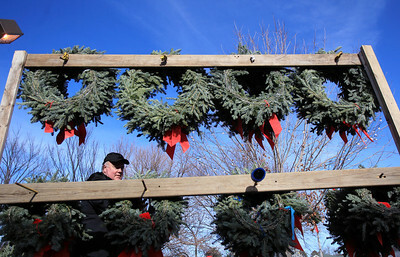 Sarah Nader - snader@shawmedia.com Chris Burns of Algonquin hangs up holiday wreaths for customers while working at the the Knights of Columbus Christmas Tree Lot at Saint Margaret Mary Church in Algonquin on Sunday, November 25, 2012. The lot opened last Friday and proceeds benefit various charities. 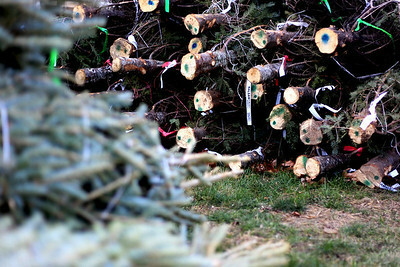 Sarah Nader - snader@shawmedia.com Trees are bundled together at the Knights of Columbus Christmas Tree Lot at Saint Margaret Mary Church in Algonquin on Sunday, November 25, 2012. The lot opened last Friday and proceeds benefit various charities. 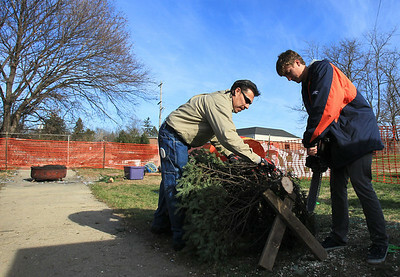 Sarah Nader - snader@shawmedia.com Rene Mendez (left) of Carpentersville and Kyle Nejman, 18, of Algonwuin wrap up a Christmas tree for a customer while working at the the Knights of Columbus Christmas Tree Lot at Saint Margaret Mary Church in Algonquin on Sunday, November 25, 2012. The lot opened last Friday and proceeds benefit various charities. 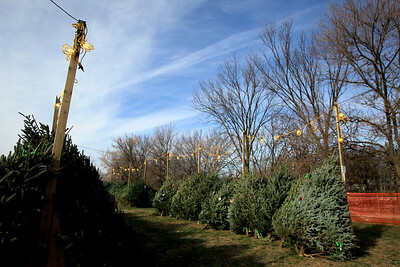 Sarah Nader - snader@shawmedia.com The Knights of Columbus Christmas Tree Lot at Saint Margaret Mary Church in Algonquin is open for business on Sunday, November 25, 2012. 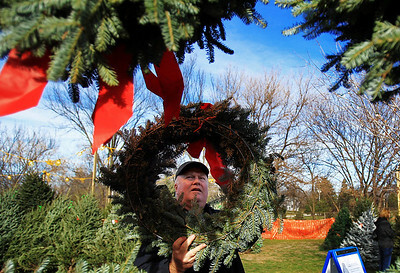 The lot opened last Friday and proceeds benefit various charities. 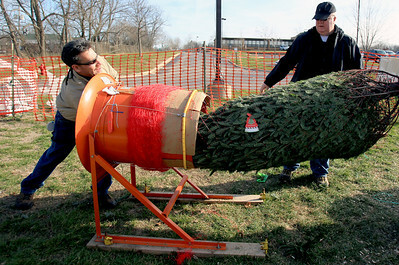 Sarah Nader - snader@shawmedia.com Rene Mendez (left) of Carpentersville and Chris Burns of Algonquin wrap up a Christmas tree for a customer while working at the the Knights of Columbus Christmas Tree Lot at Saint Margaret Mary Church in Algonquin on Sunday, November 25, 2012. The lot opened last Friday and proceeds benefit various charities. 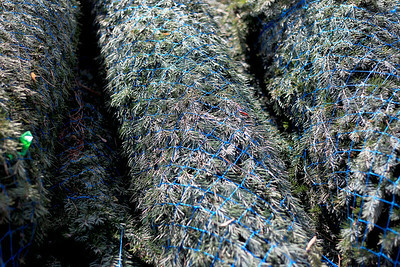 Sarah Nader - snader@shawmedia.com Christmas trees are bundled together at the Knights of Columbus Christmas Tree Lot at Saint Margaret Mary Church in Algonquin on Sunday, November 25, 2012. The lot opened last Friday and proceeds benefit various charities. 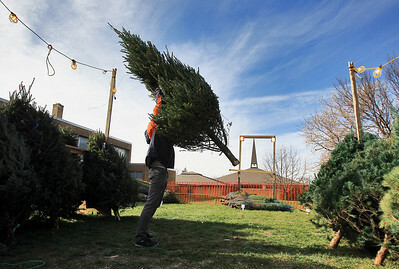 Sarah Nader - snader@shawmedia.com Tom Brey (left) of Lake in the Hills and his son, Evan, load up their Christmas tree they bought at the Knights of Columbus Christmas Tree Lot at Saint Margaret Mary Church in Algonquin on Sunday, November 25, 2012. The lot opened last Friday and proceeds benefit various charities. 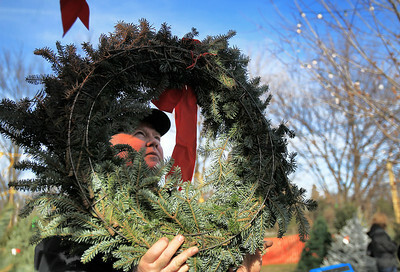 Sarah Nader - snader@shawmedia.com Kyle Nejman, 18, of Algonquin unwraps Christmas trees while helping out at the Knights of Columbus Christmas Tree Lot at Saint Margaret Mary Church in Algonquin on Sunday, November 25, 2012. The lot opened last Friday and proceeds benefit various charities. 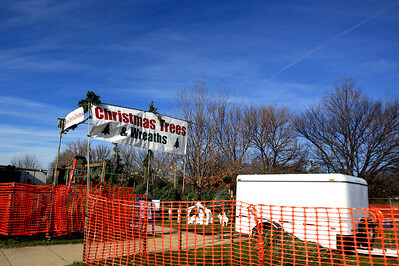 The Knights of Columbus Christmas Tree Lot at Saint Margaret Mary Church in Algonquin is open for business on Sunday, November 25, 2012. The lot opened last Friday and proceeds benefit various charities.